Selling or Buying a Sunbeam? Sunbeam started in 1877 and was initially building bicycles in the Sunbeamland Cycle Factory. The manufacturing of automobiles started in the beginning of the 20th century and the first models only featured one digit horsepower. 1959 was the introduction year for the Sunbeam Alpine, which was actually the second Sunbeam model to use the Alpine name. The 1959 Sunbeam Alpine was quite successful and received updates every year. The 1962 Sunbeam Le Mans was a big step forward with an engine tuned to the specs of the previous year’s Le Mans winner. A few years later, Sunbeam hired Shelby to work on the Alpine’s chassis and create the Sunbeam Tiger, which became a legend. Sunbeam was then bought by Chrysler, who unsuccessfully tried to replace the Ford engine by a Chrysler unit before the model was discontinued. 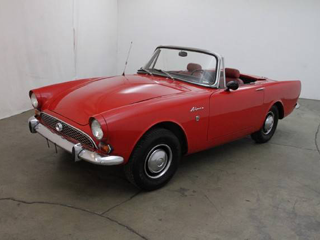 Looking to purchase a classic Sunbeam? The second generation of Sunbeam Alpine was declined in a four-door sedan, a hardtop coupe, a convertible, a station wagon, a two-door short-chassis van, all featuring different options and specifications. If you’re passionate about Sunbeams, no doubt you can find an example that fits your needs! Come visit the Los Angeles classic car dealership anytime to have a look at the current inventory of classic cars for sale, including various models of Sunbeam. The friendly staff will welcome you, answer all your questions, and guide you through your project in a hassle-free environment. Their goal is to make your experience as easy and enjoyable as possible. A good tip when purchasing a classic car is to thoroughly check the body panels for rust. Rust damage is expensive to repair and should be taken into account in your budget. The Beverly Hills Car Club would be delighted to speak with you soon about your project of buying a Sunbeam. The experts are known for sharing great tips and advice and for their wide selection of classics at fair prices. Don’t wait, give the team a call today! We Also Buy Classic Sunbeams In Any Condition, Top Dollar Paid.